Question: So tell me, Your Grace, what kind of music do you like? Answer: Oh, all kinds! I just adore all kinds of music! Translation: Most anything that doesn’t require my attention — kind of like the dining-room wallpaper. This isn’t you, obviously. Adventurers only enter here. But are we perhaps a tad tentative when it comes, say, to string quartets? What better time for your crusading reporter to run his little catechism. All by itself — other forms aside — from Haydn to the present, the string quartet secures Western classical music’s lock on the Sublime. Schubert and Dvorak are consummate melodists. None better. 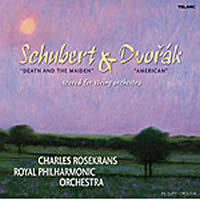 As the name suggests, Schubert’s “Death and the Maiden” hints at morbidity. In 1824, the quartet’s date, with its taste for the macabre and melancholy, the Romantic movement had dominated writing and the arts for some time. Goethe’s novel The Sorrows of Young Werther of 1787 has its protagonist, “torn by hopeless passions, especially by infinite love,” shooting himself in the head. Given what we know about American teens, one accepts on face value that the book inspired suicides among sensitive young Germans. The very model of the Gothic horror novel, Maturin’s Melmoth the Wanderer, was published in 1820, Mary Shelley’s Frankenstein, or the Modern Prometheus in 1818. Zeitgeist abounding! As you might imagine, the death-smitten Schubert was not a great favorite with the Nazi brass, though his music got more play time than did Mendelssohn’s, whose conversion to Christianity failed to cut it with Hitler’s crowd. With respect to the dark side, Dvorak simply isn’t there. His “American” Quartet (1893) fairly radiates sunshine and mitteleuropische Gemütlichkeit, albeit composed in Spillville, Iowa, a Czech enclave, in a hugely improbable 72 hours. The Telarc’s good and spirited performances took place in a venue long famed for its acoustics, London’s Walthamstow Town Hall, André Gauthier, producer; Robert Friedrich, engineer. This one is bound to please. With your purist’s instincts, you may be thinking, well, really, arrangements! Talk about compromise! Easy there, my friend, not every arrangement is as garish as Stokowski’s Bach. None other than Gustav Mahler did the “Death and the Maiden” transcription. The formidable and forbidding Arnold Schoenberg is responsible for several charming orchestral arrangements of Brahms’ chamber music. There’s a tradition here. One of Dmitri Shostakovich’s best-known works is the Op. 110a Chamber Symphony, so called, in Rudolph Barshai’s orchestral transcription of a harrowing Shostakovich string quartet, the eighth of 15, identified as Op. 110. After a good, insightful performance of either, one looks about for blood on the floor. It’s well to remember that Shostakovich survived Stalin’s displeasure. He fully expected to be hauled off and killed. As if the Terror weren’t enough, the regime’s yes-men routinely accused the beleaguered composer of bourgeois formalism. (In case you’re wondering, that’s not good.) Stir in the Wehrmacht’s adventures in Russia, and you’ve quite a turbid brew. With the exception of Béla Bartók’s six and Leos Janacek’s two, no prominent 20th-century composer better succeeds at expressing the self by way of the string quartet, the self for Shostakovich consisting in preponderant measure of despair, desolation and a will to prevail, absent the Party-line accommodations his symphonies required. The quartets’ lighter moments, and there are many, grin through clenched teeth. Franz Liszt composed a Dance of Death. Shostakovich lived it. I wonder, then, what makes good, well-intentioned people tick. Here we have one of the best reissues of recent memory, by any measure a significant event, hobbled by feloniously inadequate information. 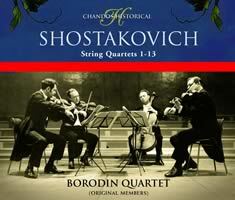 Chandos Historical CHAN 10064 (four CDs) features the original Borodin Quartet in performances of Shostakovich’s String Quartets 1-13. The 14th and 15th had yet to be composed at the time of these sessions (1967-71), not that the notes trouble to mention this or much else. This Borodin Quartet (Rostislav Dubinsky, Yaroslav Alexandrov, violins; Dmitry Shebalin, viola; Valentin Berlinsky, cello) is not the same ensemble that recorded all 15 in 1978-84. In 1974, Dubinsky and Alexandrov departed for the West, to be replaced by Mikhail Kopelman and Andrei Abramenkov. As a record of its time for music and musicians in the Soviet Union, First Violinist Rostislav Dubinsky’s Stormy Applause: Making Music in a Worker’s State (Northeastern University Press, 1989) belongs on a shelf alongside Testimony, The Memoirs of Dmitri Shostakovich, as Related to and Edited by Solomon Volkov (Harper & Row, 1979). While I believe it’s out of print, I recently scored a softcover Stormy Applause via Amazon.com. In this sort of forum, ’tis folly to attempt a detailed synopsis of 15 works or their performances. Suffice that the original Borodins lived in and survived Shostakovich’s world. Although the composer had the Beethoven Quartet in mind for his string quartets’ premieres, the Borodins played them often and to telling effect. These four men have a command of the idiom, abundant empathy, and far from least, ample chops. Be warned: One does not listen to this kind of music as a laid-back pleasure, nor do I recommend it to depressives. However, if you’re up for moments as potent as any I know, this reissue is a revelation. As to the sound, a puzzlement. Before I was sure of the recordings’ dates (I hadn’t acquired the bargain-priced Seraphim LPs back in the Seventies, nor the pricier English pressings), I assumed I was listening to mostly mono, but good mono in that I had no sense of the sound emitting from a small rift between the speakers. Here too, the Chandos notes are mute. We’re lucky to have the Historical designation. This may well be stereo, albeit curiously pinched. By ’67, stereophony was firmly established as the medium of choice. If it’s great sound you’re after, go for Deutsche Grammophon 463 284-2, five CDs, with the Emerson String Quartet, recorded live in Aspen, Colorado by the excellent Da-Hong Seetoo and Max Wilcox in ’94, ’98 and ’99. While in no way a match for the Borodins’ ferocity and pathos, the Emersons turn in good, solid performances. Remaining with the intimate — at the opposite pole — we come to Morton Feldman, in whose work emotion plays no part whatever. Shostakovich’s string quartets provide a foretaste of hell. In Feldman, we encounter pure and for the most part serenely set abstractions. It comes as no surprise that Feldman befriended the abstractionist painters of the New York School and fancied Turkish carpets as much for the irregularities of their patterns as for the patterns themselves. In the music of his mature period, the composer lays out long-line repetitions in which minute differences, gradations, and tangential shifts in direction comprise the action — such as it is. I’ll cover two recent releases, both top-notch. 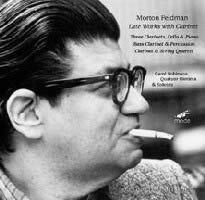 The first, mode 119, Morton Feldman: Late Works with Clarinet, reminds us that Feldman (1926-1987) ranks among the 20th century’s foremost sensualists. And of course provocateur, but of a different stripe. Parsimony and time comprise the man’s goads. The music subverts via a serene — indeed dogged — unflappability touching upon a trance state. The other, a two-disc hat[now]ART set, Violin and String Quartet (1985), commands about 135 minutes of one’s attention, which puts an otherwise challenging event in the long shadow of String Quartet 2, of which I’ve two recorded versions, both recommended: hat[now]ART 2-137, with members of the Ives Ensemble, and mode 112, with the FLUX Quartet. The five-CD FLUX set runs a full disc longer than does the hatART, a difference, in the listening, that fades to insignificance. Mind, I’m discussing performances of one string quartet. The mode is also available as a solo DVD, which, I’m assured, is even better-sounding, a possibility I find hard to believe. In offering my good opinion of either set’s exquisitely detailed sonics, I’ve touched upon Feldman as the consummate sybarite. Subtle yet pungent harmonics, silence and decays comprise a large part of the twilit show. I interviewed a composer some years back, and in the course of our talk he mentioned his fondness for Sibelius. He especially relished the feeling of being lost within the symphonies — I don’t recall which. While I cannot share my interviewee’s sense of Sibelian deracination, with Feldman, yes, in mile-high spades. If you can listen to this beautiful recording of a beautifully performed Violin and String Quartet and know where you are with respect to the starting point, would you mind autographing my copy before returning to your galaxy?
. No composer better calls colors to mind. 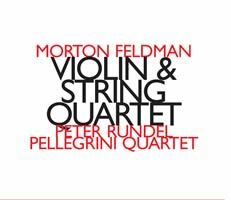 This sense of a leisurely saunter through color fields via Feldman’s unique harmonic idiom puts Violin and String Quartet among the composer’s “typical” works in an oeuvre of striking stylistic similarities where exceptions do exist, particularly among his earlier music. Mode’s Morton Feldman: Late Works with Clarinet, with a wonderful soloist, Carol Robinson (clarinet and bass clarinet), features a “typical” work, Clarinet and String Quartet (1983), and two “atypical,” Three Clarinets, Cello and Piano (1971), and Bass Clarinet and Percussion (1981). Three Clarinets, Cello and Piano, at a brief 9:33, partakes of Feldman’s signature pace and calm, where resemblances to his later music end. It’s remarkably beautiful stuff, as is the likewise unruffled Bass Clarinet and Percussion, wherein the hushed percussion, rather than participating as the harmonic counterweight we find in Feldman’s lengthier efforts, furnishes a ravishing environment for its 17:30 duration. At 42:20, Clarinet and String Quartet lofts us through an atmosphere peculiarly Feldman’s. Like the violin of Violin and String Quartet, the clarinet operates in gentle opposition to the quartet. I do love the fellow’s music.